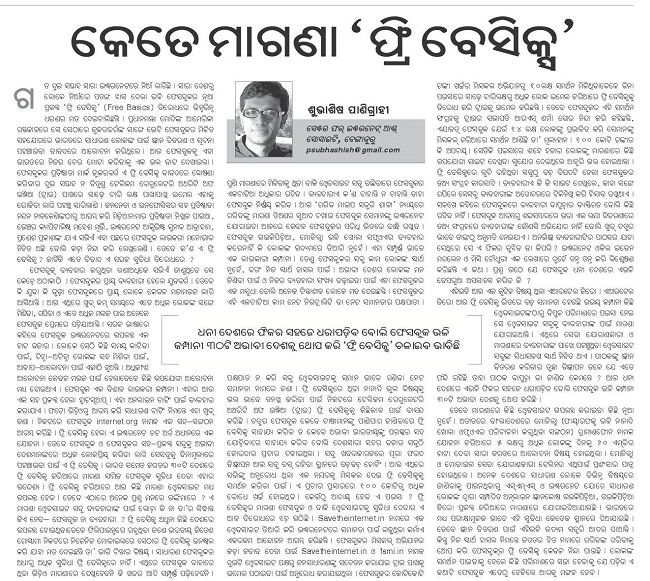 This op-ed was published in Odia newspaper "The Samaja" on January 4, 2016. Sunil Abraham and Pranesh Prakash were quoted. Facebook has set its foot in 30 developing countries with its app Free Basics to provide free access to Facebook, Facebook’s products like WhatsApp and a few websites Facebook has partnered with. This has raised eyebrows all over India as Free Basics compromises with user security and privacy and it violates Net Neutrality. This piece quotes from Eben Moglen and Mishi Choudhury’s post where they detail about the security concerns with the app. This piece also tells why projects like Mozilla’s GrameenPhone project in Bangladesh and Wikipedia Zero across many nations got wider acceptance and support for their noble humanitarian effort where Facebook is getting severe heat across all the 30 nations. Could Facebook dare to launch such a project in rich nations or it is easy to make poor nations easy targets with poor services?